The Angora has a grazing habit which has made it very adaptable to certain agriculture sections. Goats are great consumers of “browse” and have a tendency to eat as high as they can reach by standing on their hind legs. This adapts goats for grazing areas on which sheep would not do well. Angoras have been able to make economic returns on land that is unsuitable for usual agriculture pursuits. For many years, goat carcasses have been sold as low-grade sheep carcasses. 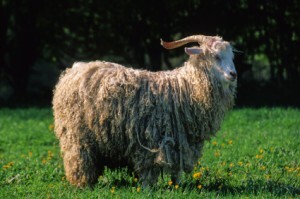 Angora goat breeders, however, have sponsored an endeavor to have the Angora goat carcass referred to as “chevon’ and sold as such on the market. It is maintained that the flesh is quite acceptable, particularly from young goats in good condition, and some people refer to it as a delicacy. The carcasses are characteristically thinner fleshed and the dressing percentages correspondingly lower than those of sheep that have been fed in a similar manner.